Here is my dilemma. I would like to grow a few pots of herbs for cooking (and just the enjoyment and beauty) on an over-the-sink shelf in the kitchen. We are in an apartment that is facing north and shaded by another building, so no light at all. In the kitchen there is not even a window. So my light will have to come solely from a fixture. The apartment is tiny and there's no cabinet space so the over-the-sink shelf is my only option. I can mount or hang an under the cabinet light over the shelf. The distance from the bottom of the cabinet to the shelf is exactly 2 ft so the potted plants would be 18 inches or so from the bottom of the cabinet. I have read so many things about lighting and being new to it all it is really confusing, and some of the lights are hundreds and hundreds of dollars. BUT I don't mind investing in a good light system because I realize that is critical and if not done properly I could end up spending more money in the long run wasting money on lights that don't produce what I need. So what would be the best lights for growing bushy green herbs? The under cabinet space is 31 inches by 9 inches (the area inside the bottom of the cabinet). The light can be somewhat wider than 9 inches if it is hung with chains, I think. But even hung with chains the longest it could be would be 33" max. I want to make sure I do this right the first time so any advice is appreciated, thanks! If you are going to use artificial light, I suggest you get shelving and put it where you have space and mount the fixture on the shelving. Use chains to make the light adjustible you want the light to be around 8 inches from the top of the plants and will have to be adjusted upwards as the plants grow. You can make the shelving yourself if you are handy or get something with adjustible shelves. you can use 48 inch florescent fixtures using 4 daylight bulbs. If that is too much light you can remove some of the bulbs. You can get 4 ft flourescent lights cheap at almost any hardware store. Costco sells shelving but I don't know the dimensions or it they are adjustible. Lowe's also has shelving in different widths but cost a bit more. Restaurant suppliers may also be a place to look. Shelving on wheels makes it easier to move if you have to clean under it. If you have the shelf up against the wall you want to put some plastic and reflective material up against the wall. 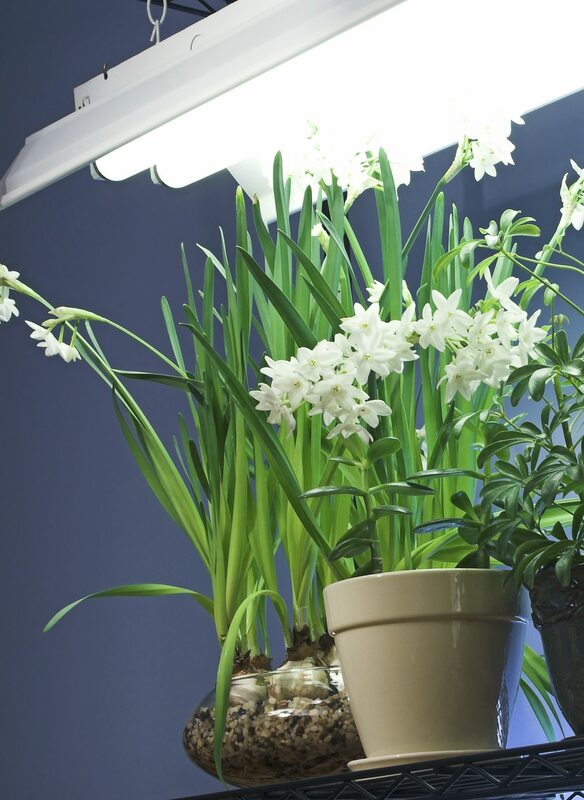 The lights do not need to be expensive, ordinary fluorescent tubes are fine, but they do need to be close, just a few inches above the tops of your plants and hung so they can be raised as the plants grow. It's a counter top with two layers of shelves over it. The first shelf supports lights for the counter under it and plants on it. The second shelf supports lights for the first one. This was in my basement with no natural light. Not even eight inches. Four would be much better and they can handle two... That was the point of showing you the pictures of lights right down close to your plants. Light intensity varies by the square of the distance. So if you have a light 2" away and you move it to 4" away, your plants are now getting one-quarter the light they were. If you move the light to 8" away, the plants are now getting one-sixteenth the light they were. Keep it close! Last edited by rainbowgardener on Sun Feb 28, 2016 6:34 am, edited 1 time in total. You said that you had limited light in an apartment. That is why I suggested a shelf unit. You can grow herbs and some other plants like orchids all the time under lights. A window would be better to get some ambient light, but in reality the overhead lights wil be better than any light coming from the side. If you have a light coming from a window and no balancing light on the other side, plants will start to lean toward the light source. You would have to keep turning the plants to have them grow evenly. On a north facing balcony it would be hard to get the high light herbs to grow nicely. Maybe mint and some onions since they tolerate partial shade. You do need the lights to be adjustible and depending on the lumens your fixture generates, and the needs of the plant, you will need to adjust the height. Flourescent bulbs do not get as hot as other bulbs. LED lights would be even brighter but cost considerably more. The cost should come down as the technology improves. I would use a wicking system for watering. It is less messy in the long run as you would only have to change the water and fill the reservoir and it is harder to over water if it is done properly. I would still take the plants to a sink at least once a week to flush and drain them to avoid accumulation of salts in the pots. You can still grow things on a northern balcony that is shaded. Your leafy greens would do okay and some herbs would produce a good crop. I've had an excellent crop of lemon balm in my full shade garden. Violas and pansies are edible and do very well in full shade. 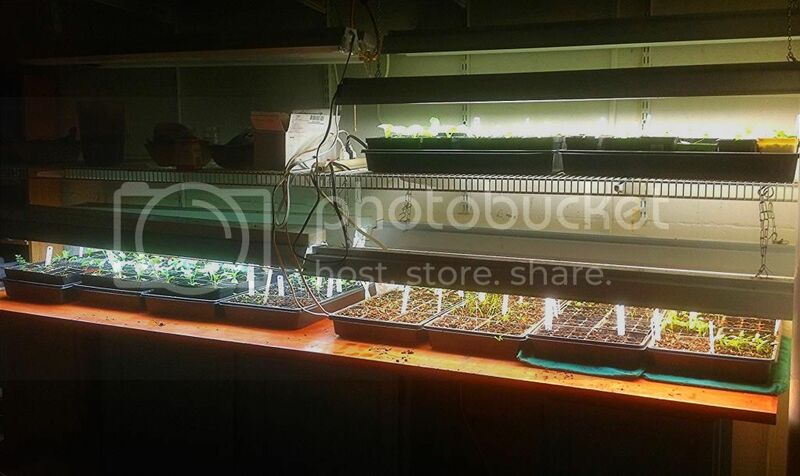 As for indoor crops, light fixtures mounted on shelving will work just beautifully. That's how I keep a lot of stuff going through our winters. True shade tolerant plants will be able to grow on a north facing balcony and even some greens. You said you wanted to grow 'bushy herbs' so I took that to mean things like basil, and the gray leafed herbs like sage, lavender and thyme. Those would probably need more than partial shade. Basil gets lanky when it does not get enough light. Let me just add a couple of 2c and herb sprigs. Your situation in apartment with little natural light is difficult for plants (and would be more-so for me!). Just a word of caution is not to set yourself up for failure with expensive light and shelf set-ups. We see ads and promo in stores and more for lovely inside herbs, growing bushy and green and healthy. If only it were that easy! To over simplify, herbs like to be outside. Inside OK for a few winter months, and even that iffy. You may be able to do a few on your balcony, and given your climate 12 months. indoor gardner: what should i look for in lighting/lamping?